A tune for the winter. For those shivering along with me, hope this warms you a little. For those in the heat, hope the wintery-ness of it all cools you right down. 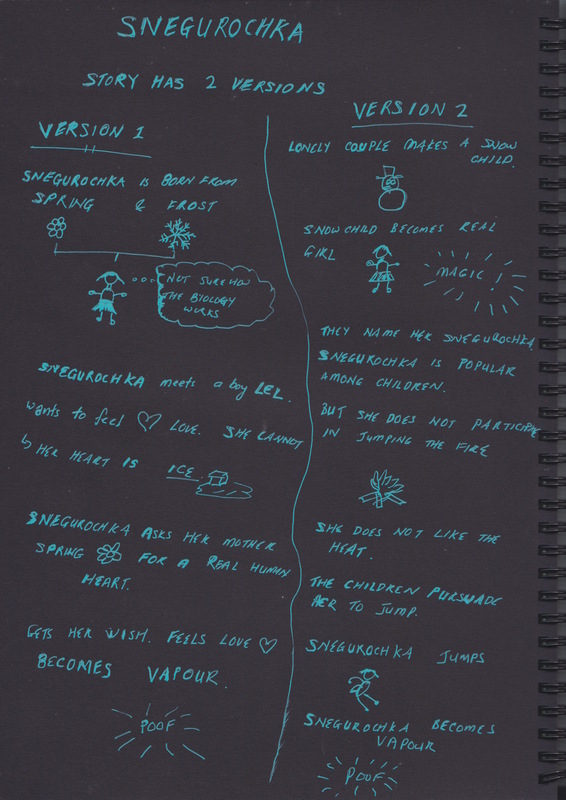 Here’s a summary of Snegurochka found in some old…surprisingly legible notes. As you can hear, I have combined both story versions. I’m still not sure what Snegorochka means to me as a song other than a little ditty about losing oneself in a joyous,delirious moment. Perhaps this is what it is. There…who said Twisted Tales was about dark things. Or maybe delirium isn’t such a good thing, but maybe…this is a little respite in the world we live in where I get a sense that world events are spinning out of control. Enjoy it. Tell friends. More in a bit!